TORONTO (AP) -- Top-ranked Roger Federer beat Sebastien Grosjean 6-3, 6-3 in the second round of the Rogers Cup on Wednesday to win his 50th straight match on North American hard courts. Federer broke Grosjean in the eighth game of the first set Tuesday and started the second set with another break. He won the last three games to advance to a third-round match against Dmitry Tursunov of Russia. "I had to adjust from playing last night," Federer said. "(The court) was much quicker today, it allowed me to be more aggressive." 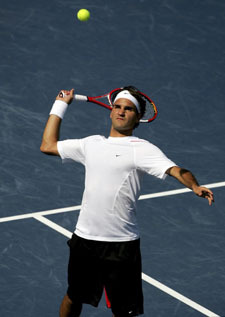 Since he lost in the first round of Cincinnati in August 2004, Federer has won eight successive North American hard-court tournaments, including the last two U.S. Opens. Defending champion Rafael Nadal defeated Lee Hyung-taik of South Korea 6-4, 6-3, and will face Tomas Berdych of the Czech Republic in the third round. Fifth-seeded James Blake and seventh-seeded Tommy Robredo both lost, leaving only three of the top 10 seeds. Richard Gasquet of France upset Blake 6-4, 6-3. The 20-year-old Frenchman has won 12 of his last 14 matches, including titles at Nottingham in June and Gstaad last month. "It's a great performance for me," Gasquet said. "The difference was my backhand on his backhand." Blake, No. 6 in the world, committed 29 unforced errors, and lost his serve six times to Gasquet. "Off his backhand side, he can hurt you from anywhere on the court," Blake said. "He can really dictate play with it. "That's pretty impressive for somebody that is not physically so large. If I'm not playing my best tennis, I'm going to lose to a guy like that. He played well. I did everything I could." Jose Acasuso of Argentina beat Robredo 2-6, 6-3, 6-4. Fourth-seeded Ivan Ljubicic defeated France's Arnaud Clement, the winner in Washington on Sunday, 7-6 (6), 6-4 and reached the tournament's third round for the first time in his sixth attempt. Former Rogers Cup champ Thomas Johansson advanced when Lleyton Hewitt retired with an injured right knee. Johansson was leading 6-3, 3-2 when Hewitt withdrew. Fernando Gonzalez of Chile, Carlos Moya of Spain and Berdych also moved into the round of 16. Gonzalez, No. 16 in the world, defeated Juan Carlos Ferrero of Spain 6-2, 6-1. Gonzalez faces Ljubicic next. Moya defeated Denis Gremelmayr of Germany 6-1, 6-4, and 13th-seeded Berdych downed Mikhail Youzhny of Russia 7-6 (3), 6-4. Tursunov routed 16th-seeded Tommy Haas in the final set to win 7-5, 2-6, 6-1. Tursunov reached the Los Angeles final and Washington semifinals in the last two weeks. Xavier Malisse of Belgium beat Paradorn Srichaphan 7-6 (3), 6-3 with only one break, while the Thai missed four chances, Julien Benneteau of France upset Dominik Hrbaty of Slovakia 7-6 (2), 5-7, 6-1 in 2 hours, 30 minutes; and Andy Murray beat Tim Henman 6-2, 7-6 (3).